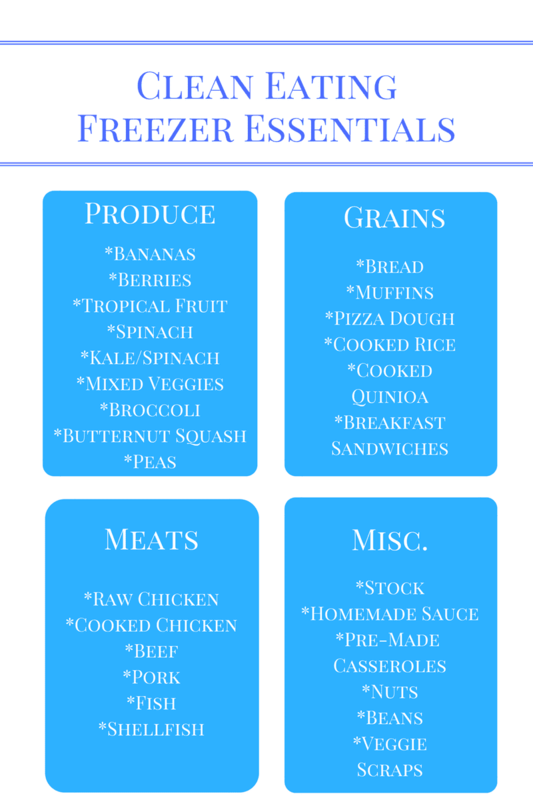 Clean Eating Freezer Essentials: What to stock in your freezer to make eating healthy a reality, even in a time crunch. These are the BEST items to freeze to help make eating at home easier. When my husband and I first got married, his parents bought us a deep freezer. At first, I thought it was absolutely ridiculous for me to own such a large chest freezer when it was just my husband and myself. But my in-laws thought it was an absolute must-have, and now I am VERY grateful to have that freezer–can you believe it is still going strong at almost 15 years old?! 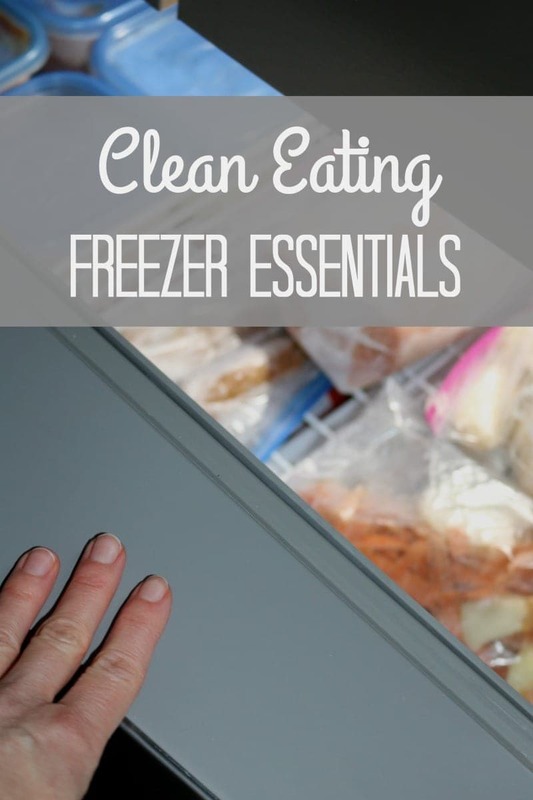 While I know that most people are not blessed with the extra space in their house to have a chest freezer, I do believe that keeping a well stocked freezer, big or small, is crucial to maintaining a healthy lifestyle when crunched for time. Frozen foods are an economical way to eat fresh fruits and vegetables. You may be thinking, but they are NOT fresh, they are frozen. And yes, while that is true, fruits and vegetables are frozen at their peak. That means the sweetest fruits and the most vibrant of greens, but most importantly, the most nutrient-packed. Frozen fruits and vegetables are often a much more economical way to incorporate produce into your family’s diet as well. You are able to enjoy off-season produce year round for reasonable prices. Plus you just use what you need–no wilted greens left in the produce draw at the end of the week. That means less food waste, which translated into more money in your pocket. Bananas–when fresh bananas are starting to turn burn, peel and toss them into the freezer. Perfect to pull out for smoothies, or to thaw and use in banana cookies, oatmeal, or banana bread. Mixed Vegetable: Perfect to throw into soups or even chicken pot pie. Raspberries and Mango: I love to snack on both of these as a treat or use to make smoothies. Pineapple: perfect for my Pina Colada Smoothie. Strawberries and Berries: For muffins, berry crisp, breakfast bars, strawberry bars, breakfast bowls, and smoothies. Frozen Spinach and or Kale: I use frozen spinach in my Green Eggs, Sweet Potato Egg Boats, Mediterranean Quiche, and Tortellini Soup just to name a few. Butternut Squash: Squash is one of my favorite vegetables. I love to roast this and add to quinoa salads or steam to make a puree. Broccoli, Green Beans, and Peas are my kids favorites, so there are always bags of these vegetables in our freezer. Vegetable peels: this is one of my biggest money savers. I place all my vegetable peels in freezer safe bag and place into the freezer for use in my homemade stocks. Of course, be sure to stock your freezer with your family’s favorites! Cooked Rice and Cooked Quinoa: Pre-cooked grains make dinners a breeze to throw together last-minute. Pizza Dough: When I am making pizza, I will often double or triple the recipe for dough, and store a ball of dough in the freezer. When the craving for pizza strikes, defrost the dough and bake as usual. Bread Scraps: When there is a lone slice of bread or that heel piece leftover, toss in a freezer safe bag and you have the base for stuffing or homemade bread crumbs in a pinch. Muffins: My freezer is always well stocked with muffins of all kinds that are perfect for school lunches and snacking. We love PB&J Oatmeal Muffins, Blueberry Muffins, Corn Dog Muffins, and Pizza Muffins. It is much more economical to buy meat in bulk and then store in freezer and use small portions as needed. I will freeze fresh meat on my own, but I also buy pre-frozen meat to use. Chicken: Breasts, wings, legs, whole chickens etc. I am then always ready to make dishes like Chicken Marsala, BBQ Drumsticks, and many more dishes. Cooked Chicken: After roasting chicken breasts or making my Rotisserie Chicken, I like to cut off the meat and freeze into 1-2 cup portions to use in recipes. Ground Beef in 1/2 pound portions to use in dishes like Meatloaf, Beef Stroganoff, Clean Eating Hamburger Helper, and Sloppy Joes. Fish: like salmon, tilapia, etc. Nuts: Buying nuts in bulk is a great money saving strategy, but to keep them fresh, I pop them in the freezer. Chicken stock: My homemade chicken stock is always in the freezer to use as needed. Tomato Sauce: Make a large batch of tomato sauce and keep on hand to use for pasta dishes throughout the week. Cooked Beans: There is nothing more frugal than cooking dried beans. Whip a large batch and keep in smaller portions to pull from as needed for like taco salad. Ravioli: To create my Ravioli Lasagna which is perfect for a weeknight meal. Breakfast Sandwiches: Make a large batch and freeze to pull out as needed. Casseroles: I love to make an extra casserole or 2 to always have dinner on hand for busy nights. Creamy Chicken and Rice, Parmesan Chicken, and Lasagna are all my go tos. Be sure to check out my post on Unexpected things to Freeze for more great options to keep in your freezer. Your chest freezer is literally the gift that keeps on giving! I am fortunate to have one as well, and I keep mine stocked up much like you do. I used to shy away from the frozen veggies, but finally gave in about a year ago. Sometimes, there’s just not time for fresh! And I don’t think I could live without my wholesale club. I do love to keep frozen fruits in my freezer at all times though, great for smoothies! I hope this inspired you to stock your freezer with more than just staples for smoothies–although, smoothies are a GREAT thing to always have on hand. What a great list! Very informative. Thanks for sharing. Gotta say I don’t freeze many things. Mostly peas and fruits. Sometimes bread. Found this pretty helpful as I had no idea you could freeze some items like quinoa or butternut squash. Yes, quinoa rice, and squash freeze beautifully. Reading this gave me inspiration! Now I can have a healthy fridge and feel good about it! This post is so helpful! You’ve given me a few ideas of foods that I currently don’t freeze and supplied me with some great sounding recipes!! Oh I am so happy to have inspired you Renee. Thanks for all the great freezer tips my friend! I also have a chest freezer and I’m so grateful, it’s a wonderful way to be prepared and save money! I just got a chest freezer!!! Life changing! Great list. YES!! You are going to LOVE it Erin!